This hike can begin in a number of places, but for this guide, I began the hike on Forest Road #2904. The first mile of this hike is on Trail #294, which is open to motorized vehicles. The last .7 miles is for foot travel only. As you leave the parking area the trail climbs gently in dense forest. The hike can be a bit challenging with the motorbike V shaped trail. But its not bad and the hike is worth it. 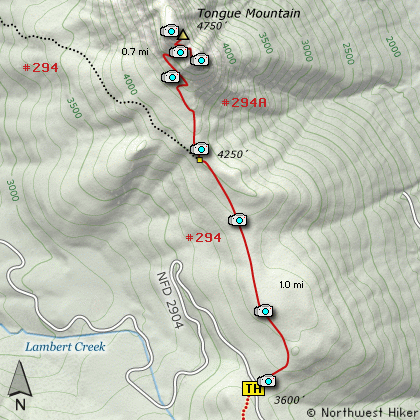 At about 1 mile you will come to the junction of Trail #294A which you need to take to the top of Tongue Mountain. The trail climbs gently at first, then begins a series of steeper switchbacks. It is at this point that you walk out of the dense forest and into the open. Now the views begin. This short hike offers some of the best views per mile of any hike in the Gifford. Each switchback that takes you higher brings more outstanding views. The trail actually takes you to the saddle between two parts of Tongue Mountain. The north side of the mountain is NOT something any person should attempt without technical gear and experience. The south side on the other hand is quite safe as long as you stay on the trail. The last 100 feet is steep and a bit imposing. But you will find the top large and safe. Just keep away from the edges of the cliffs. 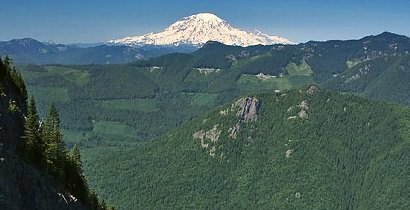 The views of Mt Rainier, Mt Adams, and Mt St Helens are outstanding and very much worth the effort.